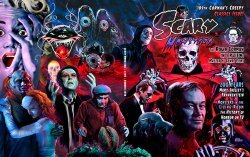 Attention Retailers: Make the 109th Corman's Creepy Classics Issue of Scary Monsters Magazine available to your customers! Please take note below of our updated policy on retail sales. Now perfect bound and a whopping 176 pages of monster-y goodness! To Order: Select your desired quantity of copies of this issue at the drop-down menu above. Please note: Sales of the magazine must be at or above the retail price (not including shipping) for at least four months from the date of receipt. Updated Policy Concerning Current Issue Wholesale Copies: Wholesale copies of our current issue are not made available to retailers planning to offer them for sale on any auction sites such as Ebay. We reserve the right to deny wholesale purchases by retailers that do not follow this policy. This policy does not apply to back issues #101-108 and back issues of Monster Memories #24/25.